We’ve been spending a lot of time with ASUS lately and for good reason too. Over the last few months we’ve seen the tech brand drop some impressive new devices, so it only made sense we get hands on with as many devices as possible. Today is about that office on the go lifestyle and the technology that comes along with that lifestyle. Both ultrabooks and tablets continue to be more favoured today due to their size and reasonable performance abilities. In the ASUS range there’s their ZenBook 14 ultrabook which is compact & lightweight, whilst still packing quite a punch performance wise. And then there is their ZenPad 10, for those who need media use in the smallest form possible. Pros: light and compact, strong performance, impressive high-res screen, sunning design. I’ve switched devices and made the ZenBook 14 my day to day laptop throughout my freelance period, just to see how worthy it is to become my workstation. And as expected it did not disappoint me in the slightest. 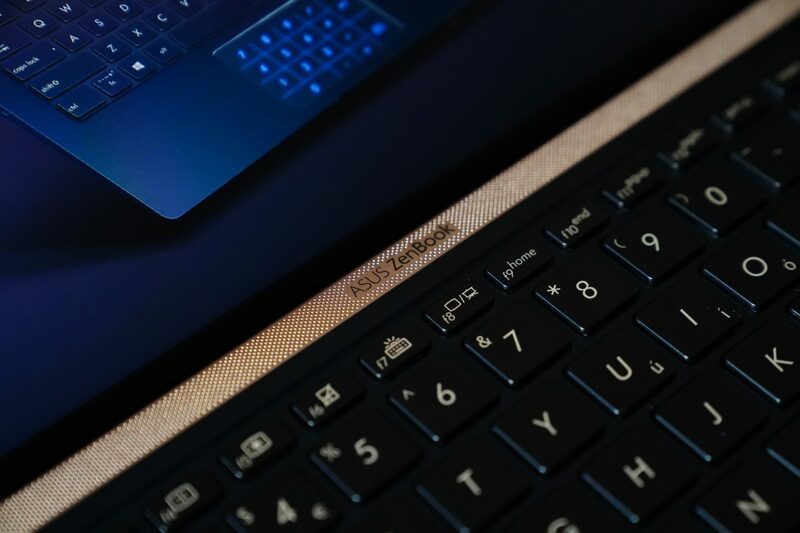 Aesthetically speaking the ZenBook 14 is one of the most good-looking laptops on the market, especially with the metallic finish and gold trim on the speaker. You throw in the almost zero-bezel WideView display and it’s almost hard to note love this laptop. 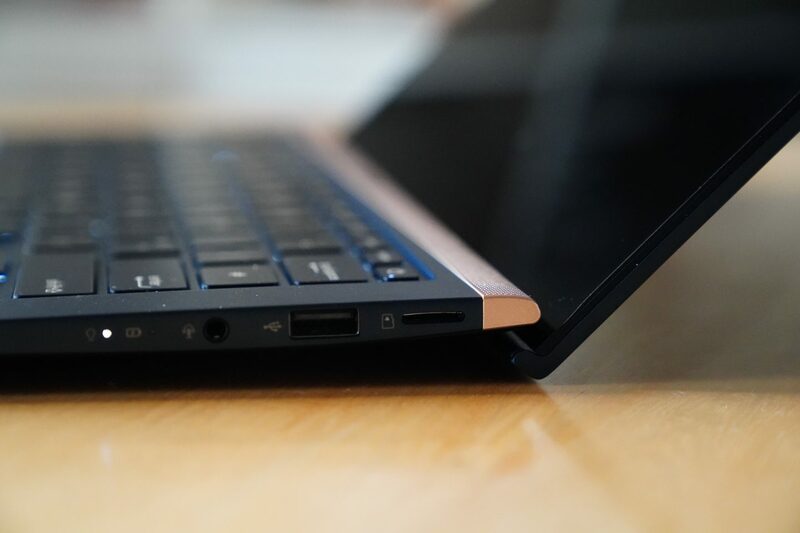 The Ergonomic swing of the ZenBook 14 helps keep it slim and lightweight, but also doubles up as a stand to keep it off the surface enough. The reason behind this, is that is helps to maintain air flow and keep the ZenBook 14 cool. A simple yet impressive design feature that will keep your machine performing right. Under the hood of the ZenBook 14 is either the Intel I3, I5 or I7 processor. This all depends on your requirements and of course your budget. The model I’m using packs the I7 processor with speeds of 1.8GHz. As it’s the 8th gen I7 and as far as processors go, it will handle some of the most demanding applications out there like photoshop, lightroom and big spreadsheets in Excel. 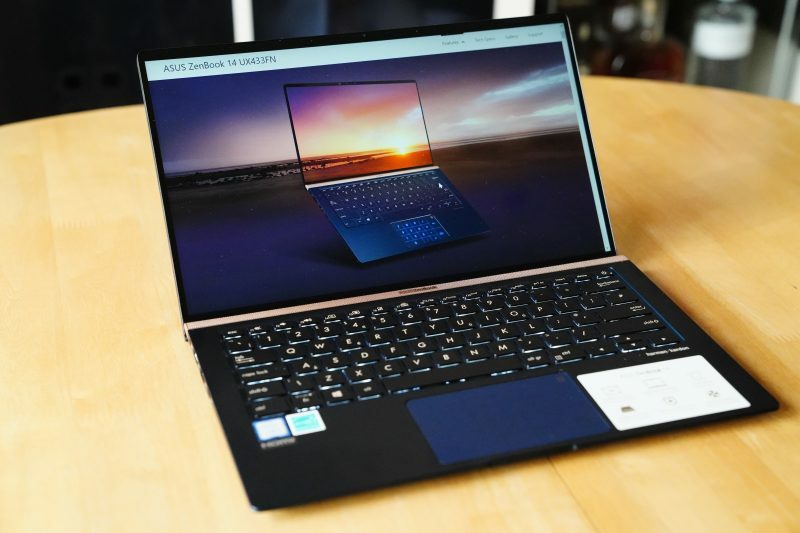 From a graphics point of view an intel UHD 620 is built on-board, which is substantial for most things, but it’s not as powerful as the Nvidia 1050 you see in the ZenBook Pro. Like most modern laptops today the ZenBook 14 has an SSD storage, which not only keeps the weight down, but the boot-up speed rapid. The ZenBook 14 comes with either a 256GB or 512GB storage. Whichever you choose to go for, you’ll have the speed reliability of the Gen3 SSD. Now given the compact size and slimness of the ZenBook 14, some preferable elements had to be left behind. As well as being a photographer and content creator the other half of me is a web analyst who spends most of his time dancing in spreadsheets like Michael Jackson in Thriller. If you crunch numbers you probably also rely on the number key as much as I do. The ZenBook 14 doesn’t have one on the keyboard, but this is not a deal breaker. 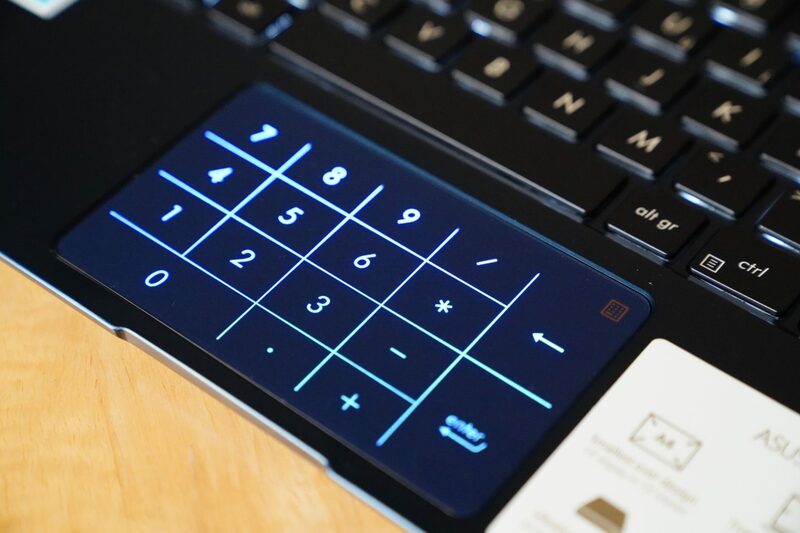 And I say this because the clever bods at ASUS built this into the touch pad itself. By simply pressing the small gold icon on the touchpad, it transforms itself from being a functional mouse, to an on-board number pad, so you can resume crunching numbers the way you’ve always wanted to. If you have a wireless mouse connected to your ZenBook 14, it makes the cross functionality of this feature even better (and you won’t necessarily need to ever turn it off. Pros: nicer tablet design, lightweight, good battery life, runs games okay. Cons: built-in cameras average, small storage capacity, not the fastest CPU. 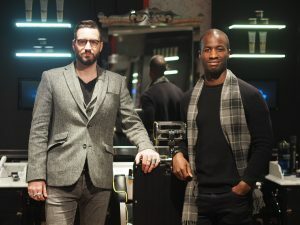 One of the joys of doing what we do on Maketh-the-Man is getting to find out brands that do product we weren’t aware of (and getting to test them out too). 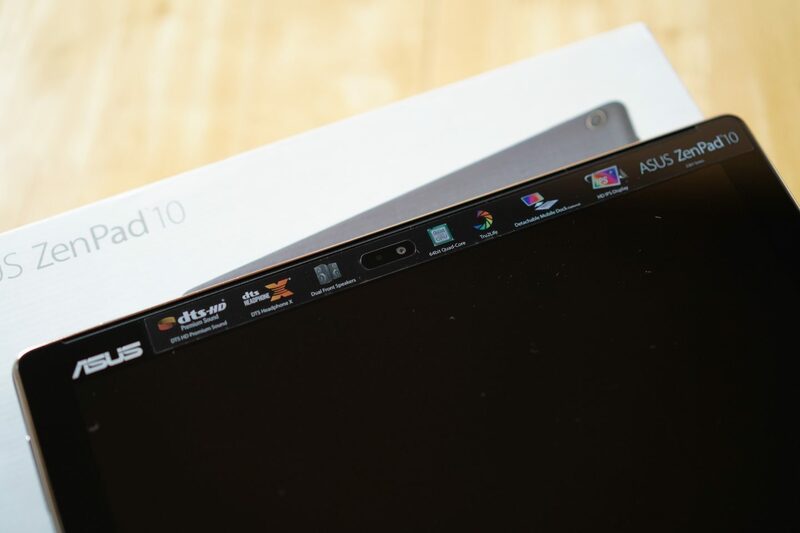 The ZenPad 10 is ASUS’ answer to the tablet markets variety of devices. 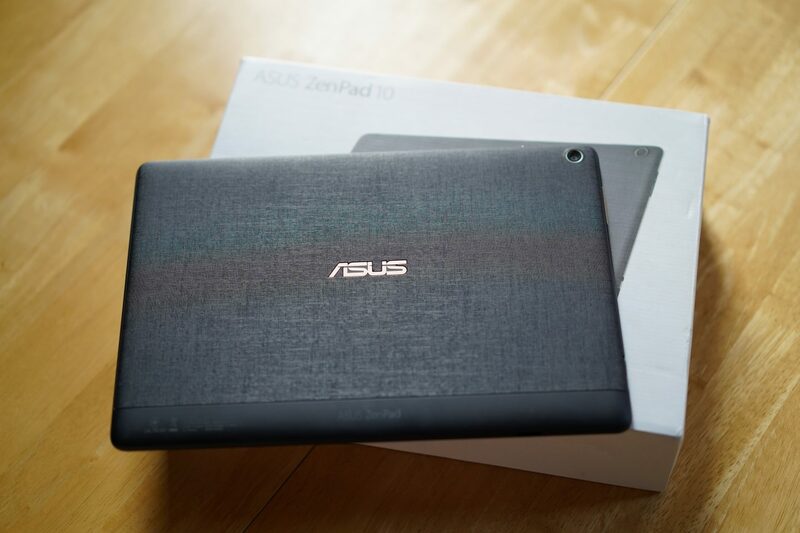 However, the ASUS ZenPad 10 is more in the region of affordable tablets, so expectations are to be managed here. Memory wise it comes with several options; 2GB or 3GB, obviously the more memory you opt for the more the price will inflate. From a storage perspective there’s either 16/32/64GB options but in this day and age, nothing below 64GB is even worth entertaining. Graphics are okay and will handle your average mobile games. But where it loses slightly is its resolution. A screen 10” in size, but the resolution sits at about 1920×1200 pixels. The ZenPad 10 is not the device to substitute as your desktop, but more the side-line device to manage quicker tasks (e-mails, browsing, communications, etc). But that shouldn’t be an issue on this front because tech like the ZenBook 14 will serve all your needs nicely. ASUS have a wide range of tech at their disposable, ideal for setting yourself up with the office you need (at home or in the organisation). You’ll be able to find the Zenbook 14 at most outlets including John Lewis and the ZenPad 10 on Amazon.